Although confined to psychiatric hospitals for more than 30 years, artist Martín Ramírez (1895–1963) produced more than 450 dynamic drawings and collages imbued with hypnotic power. Through the use of repeating lines and idiosyncratic motifs, Ramírez transcended his own situation to create a remarkably visualized world free from the constraints of borders and, even, of time itself. 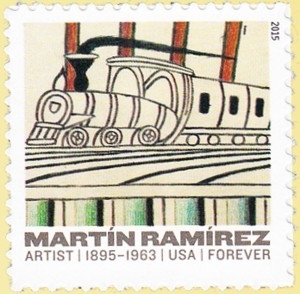 This stamp shows a detail from “Untitled” (Trains on Inclined Tracks) from circa 1960–1963. Born near Guadalajara, Ramírez left Mexico for the United States in 1925. Like other migrant workers during this period, he worked in mines and on the railroad but was hit hard by the Great Depression. Emotionally upset and in poor physical condition, he was detained by police in 1931 and, unable or unwilling to communicate, was soon committed to a psychiatric hospital. He remained institutionalized for the rest of his life. After several attempts to escape from the psychiatric hospital, Ramírez began to draw obsessively. Over the next 32 years, he created a series of large-scale drawings—from two feet to more than 20 feet long—that blend the emotional and physical landscapes of his life in Mexico with the modern popular culture of the United States. He worked primarily with found materials, like discarded paper, matchsticks, and tongue depressors, as well as homemade glue and paint. Some of his drawings were exhibited anonymously during his lifetime, but it wasn’t until a decade after his death that his work began to receive widespread attention. An acclaimed retrospective held at the American Folk Art Museum in New York City in 2007 established Ramírez as one of the great artists of the 20th century.